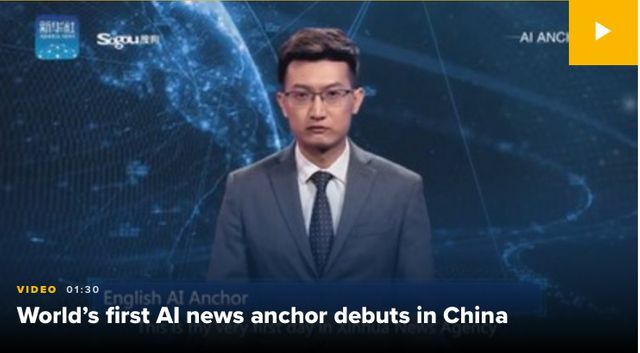 A Chinese news agency has launched its first artificial intelligence (AI) news presenter, who it's reported (pun intended) who learns from live videos and reads text, in a virtually natural way. Change brings concern and can lead to fear. But I am reminded of Kai-Fu Lee, a Taiwanese venture capitalist, technology executive, writer, and AI computer scientist, comment earlier this year, “I think we're here to create and to love, so I would advise that young people think about how can I be a part of creating and that is not just scientific creating, but it's scientific and medical and literary journalism. Those are all things that AI cannot do, and then in terms of compassion and love, I think a lot of jobs that we have will need to be greatly expanded and changed into more compassionate and empathetic . . . young people should think about creativity; they should think about compassion as the two important magnets that will create lasting non-replaceable jobs”.AI. Note: this post was written by a human.